Below are some of my paintings, many of them are inspired by things I have seen elsewhere. Many of my ideas stem from other artist paintings because I enjoy putting a twist on works I find inspiring and beautiful. I hope to bring inspiration to others and to encourage myself to paint more frequently. Following my journey into minimalism, I starting using a bullet journal to make myself accountable for the items I bring in and keep. You can see on the left picture I have all my shoes listed out. I have them categorized. On the right I have little messages to myself because bullet journals do not have to hold any theme or rhyme, just serve your purpose. I think including more of the aforementioned pictures (look in last post) help bring more personality. What is more Morgan? The space, the plants, the Game of Thrones? I wanted to do something simple yet personality filled with some of my unused and wasted paper scraps. Trying to reduce waste I used the background paper from my ASR project. These drawings are from when I used to pen draw constantly and they'd been in a very ugly, very tattered journal I hadn't touched in years until I started designing my tattoos (hold fast, pictures and explanations will come soon). This is my reimagining of these old scraps. Long story short, I am working toward minimalism. With severe anxiety having cluttered spaces makes incredible unhappy in my room, a least before I reorganized and redid everything. I worked extremely hard on the design of the room in order to use the least amount of space while still representing me. 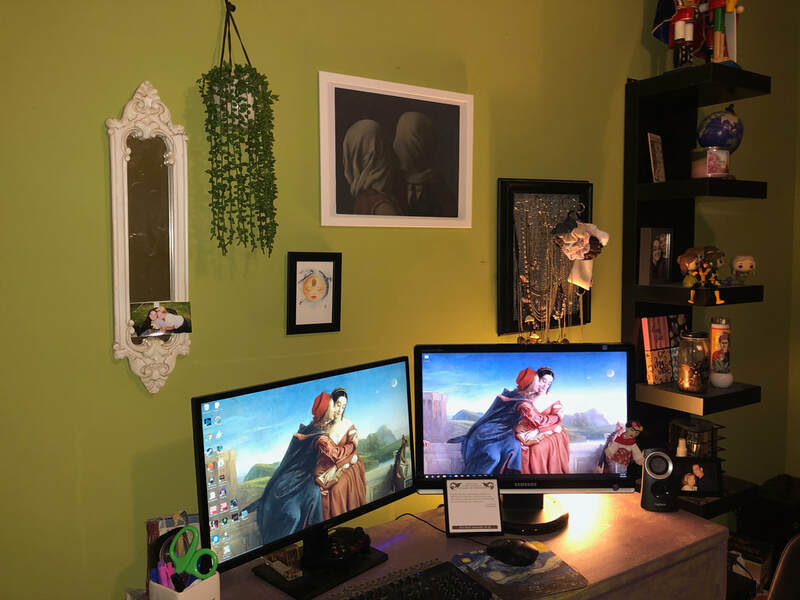 In the center, my favorite painting "The Lovers" by Rene Magritte is the center of this wall because it truly makes me happy every time I see it. 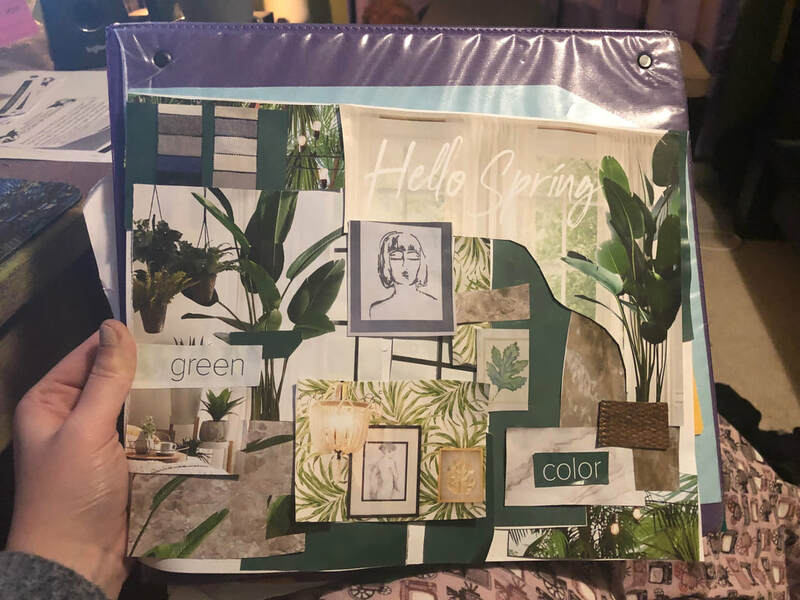 Taking an old Rooms to Go advert catalog, I wanted to make something that expresses how I am feeling and brings some beautiful green into my life. I have become a "plant mom" which means I basically have completely embraced my love greenery. My room has become a small forest in itself with various real and fake plants. I just want to make my space more positive and make myself smile when I look at my binder. 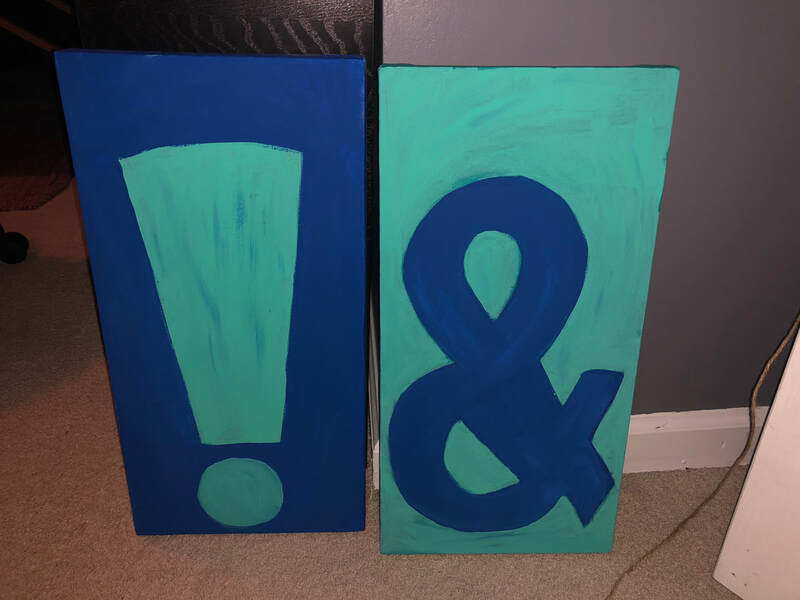 After a few complains about the fading colors and need for some changes, I repainted these designs while trying not to take away from what the original artist wanted. I really enjoyed the designs and ideas of the coloring so I kept it the same. Whoever painted these had a really cute idea and I am happy to help it along and make the Newspaper room look even better. For more examples of the designs that hang in our normal newspaper room, look to my previous post. Trying to spruce up the main Newspaper room, I started repainting some worn down canvas's that have been in the room for a while. The faded colors made me a little sad and I wanted to try helping the room out. Mrs. Zavala wanted me to keep the color scheme but I happily brightened them up. In celebration of the upcoming holiday (Halloween!) I carved a pumpkin! I know this isn't the typical post on here but this pumpkin took a VERY long time to carve. I make a cute cat on one side and added "spoopy" to the other side. The term "spoopy" a funny little spin on spooky, is my personal favorite word during the month of October. In spirit of the season I wanted to immortalize it inside of a pumpkin friend. During a sleep over, with help from my friends Meghan, Ashlyn, and Chloe, this adorable piece came to be. Believe it or not, this is one of my favorite pieces of art on my walls because of how much these girls mean to me. Being my oldest friends, they've grown up with me and seeing it on my wall makes me smile. Yes if any of you are reading this, I did keep it! I remember being not much older than 8 when this was made. Sitting at the counter of my uncles house at Christmas, my Nana (grandma) gave me my own water color set and I got to painting immediately. I used a coloring pencil for some of the small lines within the painting and the cheap water colors for the other parts. I know for certain this was my first ever painting and it sits on my shelf to this day. Little 3rd grade me created this masterpiece with help from my very sweet art teacher (Mrs. Holcomb?). Using sponges and cheap acrylic paint I dabbed the colors onto a thick paper. Once the paper dried I added some cut out pieces of paper to make some beautiful trees, overall this was an adorable little craft that still looks cute on our hall wall. Like the other birdhouse, this was for my boyfriends parents. I spent a lot of time specially designing this to match the personality of his mom's purple loving personality. I wanted to add some "marbling" but it wasn't that great with my limited acrylic paint. Regardless, it turned out beautiful because of the lavender color and I am proud out it. After an arts and crafts festival with my boyfriend and his parents, they asked me to paint them some bird houses they bought while walking around. This little bird house is for his stepfather. Loving the Marvel Universe and Captain America, he wanted something with that theme. I whipped out the paints and made sure I could make the roof of the bird house look like the famous Captain America's shield. Putting aside the patchy red paint, I think it turned out pretty good! I ventured into some funky territory when I decided that I wanted to paint this plague doctor. I had been watch way too many random documentaries on Victorian England. If unaware, Victorian England was the equivalent of a dirty toilet seat when it came to cleanliness. The image of these doctors was very fascinating due to the masks they wore. These doctors believes odors or "bad air" spread illness so they kept herbs in their mask to block it. These are basically the doctors of death but they're also cool looking. At the community garage sale I bought this bust, and pun intended, it was a bit of a bust. I have always wanted to have a greek goddess looking statue because I have always thought they were beautiful. After having to replaster one side of it that had broke, I repainted it to match in color and shading. Honestly I am very proud of this piece and will display it as much as possible. To shake things up, I decided to paint a box that I found in Michael's for a two dollars. I loved the cute heart cut out and it was so cheap that I wanted to get it while I was there looking for paint, which by the way, is only 75 cents per bottle. I used some of this new paint on the box since it matches my room perfectly and looks cute on my shelves. A big change in style, but nonetheless interesting. It look a couple of hours but majority of that time was spent on the building and adding in color variation. The lettering was also incredibly difficult to do, I redid them many times, especially the cafe one. Putting in all the colors and mixing shades made me really happy, I rarely get to mix them this way. I am really happy with how it turns out. Going along with my love for gifting paintings was this gift to my "second mom", a wonderful woman named Rosa. She's become a wonderful influence in my life. She loves trees A LOT. For years she has been asking for something like this for a while so I wanted to make her happy. I gave it to her for her birthday. Messing with the different greens and shades of brown was really interesting. Although it is simple, I enjoyed making it. I recently found this painting again, it is my all time favorite painting that I have ever created. The female figure reminds me of the armless Venus statue. The painting took forever and you can see the individual strokes I took and the time I spent on it. Something about it makes me happy, I can see my progress. As a way to show my love and appreciation for the amazing people in my life, I painted these hearts. Valentines Day, a holiday I previously didn't enjoy, was fun and exciting this year. I spent it with my boyfriend and dad, both were very kind and loved their gifts. I had just bought wooden hearts from target and painted them. The small one for my dad was only $1 and the bigger one for my boyfriend was $3 but significantly larger. During a time in my life where I felt overwhelmed with stress, early stages of depression, and general life issues, I painted this specific painting. The girl is an idealized version of myself, which was entirely unintentional. 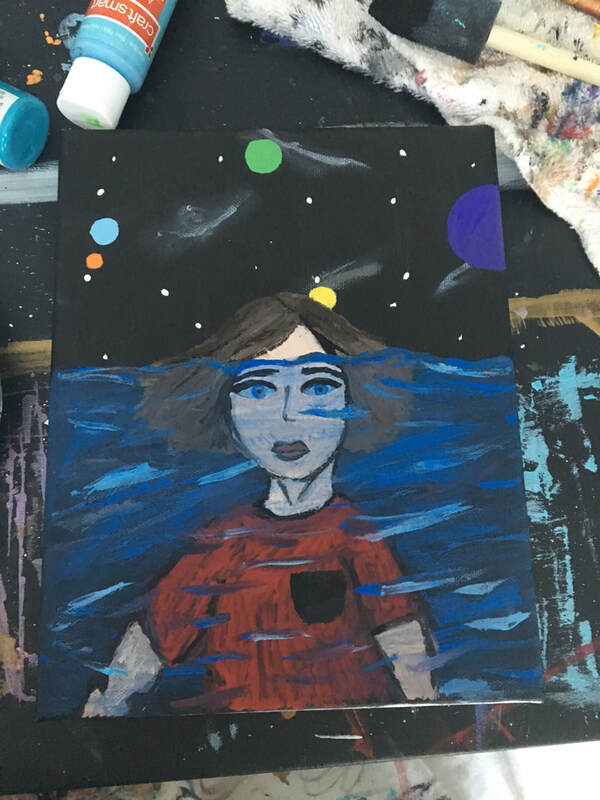 I painted this to show how I felt like I was drowning in nothing, in the empty space around me. Painting is odd, even the painter sometimes doesn't know whats going to happen. Acting as an extension of my hand, I painted out my frustrations because sometimes its just too hard to say what you feel. One of my first paintings is this muted colored muslim woman. I came across a photo of a woman with the most striking eyes and beautiful hijab and I felt inspired. I was not very experienced when I painted this. I have been planning on fixing it up but I find the obvious brush strokes charming. I remember my frustration while trying to get her features right, the lines were difficult since unfortunately my canvas was extremely small. I do really like my use of color, I want to go back to using a wide spectrum like I did here. This painting is based off of a painting by one of my favorite surrealist painters Renee Margaret who inspires me everyday. A lot of my paintings stem from his work or my attempts to duplicate his work since I find them beautiful and interesting. This one is called "The Face of a Genius" or at least the original painting is called that. 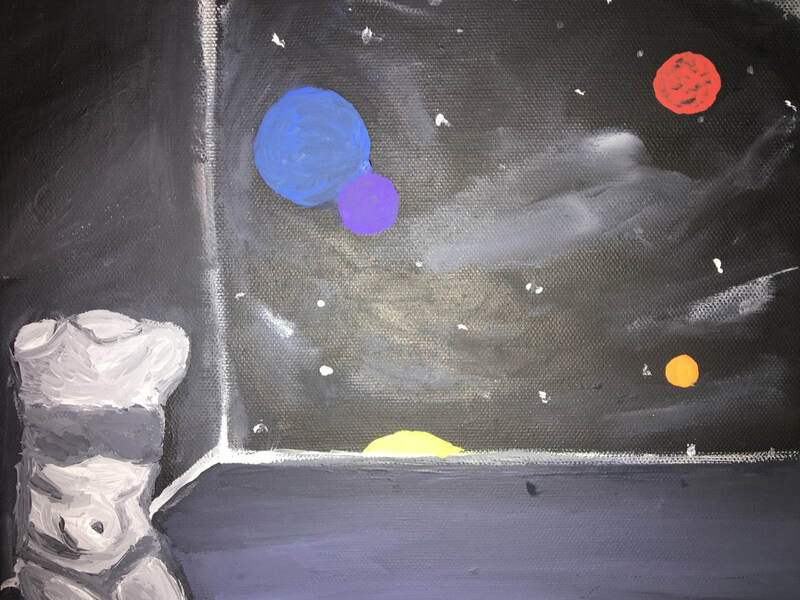 My painting is different because of the background and how its space themed as usual. I would argue this is one of my favorite paintings of mine because of how different it is. Sitting below my monitor is this painting, one I specifically made to help the space feel more like me. The painting, as usual, has a lot of ties to space and this time, it also has aliens. I made this when I first heard I made it onto newspaper staff and wanted to have my desk space be as comfortable as possible and nothing makes me feel more at home than space. The colors remind me of starry night and of the Mass Effect series at the same time, which I find amazing. My latest painting was something I made in the spur of the moment but has ended up being one of my new favorites. I remember being so inspired all the sudden and decided that I'd whip out the paint and let whatever I thought go on the canvas. 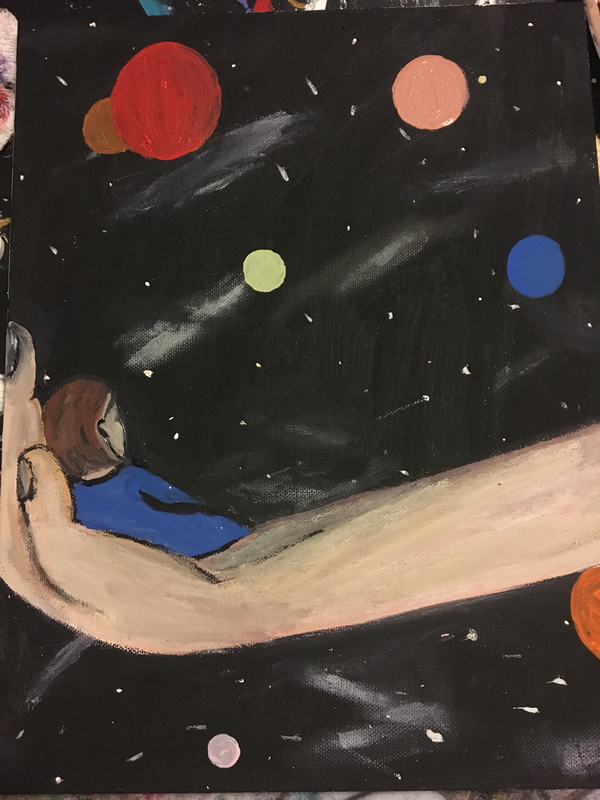 Unintentionally I ended up painting what seems to be me in my own large hand. You can interpret that however you wish, I am honestly not even sure why I painted it. This painting is truly my original piece with no outside influence, this is the first time I have been able to do this and actually liked the outcome. It's nice to see my own progress and to see significant changes in the way I paint and the way it looks. To show my appreciate for one of my favorite teachers, Mrs. Essenburg, I made a Hogwarts themed painting that was more cartoonish because she loves Harry Potter. Surprisingly this was actually difficult due to all the castle like features that make it interesting. I am also terrible at shading which was a necessity of this painting and making it come to life. It was an interesting change from my people centered paintings and the typical theme I follow when I paint, it served as a big challenge for me. So like with many of my paintings, I replicated this from something else I had seen while looking for inspiration. I loved the coloring, I obviously put a spin on the original image to try and make it my own. The name is based of "Space Oddity" by David Bowie. I highly recommend you binge some Bowie and look at some paintings. One of my first paintings was this one of Frida Kahlo. This was during a time in which I was still testing the waters so this is based off of a similar work I found elsewhere. After I discovered my love for art, Frida gave me the courage to share what I was doing. She is also a surrealist painter but she pushed for female empowerment as well, challenging gender roles everywhere she went. Her love of her Mexican culture also inspires me due to how personal and powerful her paintings were. My paintings usually are bred out of times of struggle in my life. 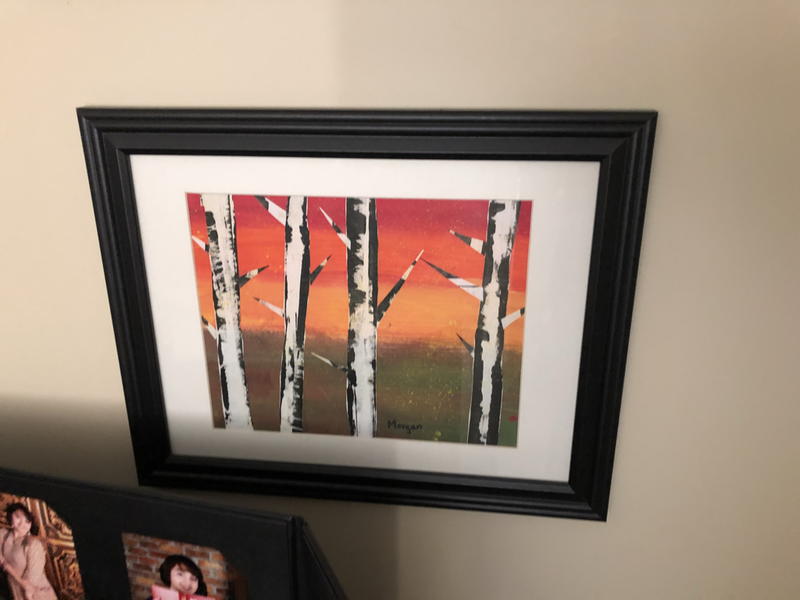 I started painting last year after I had a depressive episode and haven't stopped since. Though this is not one of best paintings, its one that means the most to me. I gave this painting to my Spanish teacher, Sra. Fair-Tham because of how kind and supportive she has been to me and because she also shares a love for Frida. It still resides above her desk onlooking the classroom.